The Sixty-eighth General Assembly of the Orthodox Presbyterian Church convened on Wednesday, May 30, at 8:00 p.m., at Reformed Bible College in Grand Rapids, Michigan, with a two-hour worship and communion service in the college chapel. 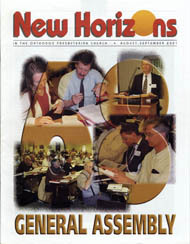 It was led by Thomas E. Tyson (regional home missionary of the Presbytery of Philadelphia), Hailu Mekonnen (associate pastor of Grace OPC in Vienna, Virginia, and missionary to Ethiopia), William Shishko (pastor of Franklin Square OPC in Franklin Square, New York), and Larry Wilson (general secretary of the Committee on Christian Education and editor of New Horizons). Piano accompaniment was provided by Calvin R. Malcor (associate pastor of Covenant OPC in San Jose, California). And all things are of God, who hath reconciled us to himself by Jesus Christ, and hath given to us the ministry of reconciliation (2 Cor. 5:18 KJV). Through Jesus Christ, God has reconciled himself to us, washing away our sin and clothing us in his righteousness. This reconciliation with God works itself out in our relationships with one another. Because each Christian has been united to Christ, we have been united to each other in the one body of the church (1 Cor. 12). In December 1999, the Rev. Walter D. Copeland, Jr., began his ministry at the Presbyterian Church of Cape Cod (PCCC) in West Barnstable, Massachusetts. Although short, his ministry had a powerful impact on our church, and it changed lives.